A Fulbright Scholarship from the U.S. Department of State* allowed me to spend a year studying snake charming in Morocco. I delved into the history of Moroccan snake charming and also spent time regularly interacting with snake charmers in an area of Marrakesh famous for its entertainers. Dr. Tahar Slimani of the Biodiversity and Ecosystem Dynamics laboratory at Cadi Ayyad University advised my project. 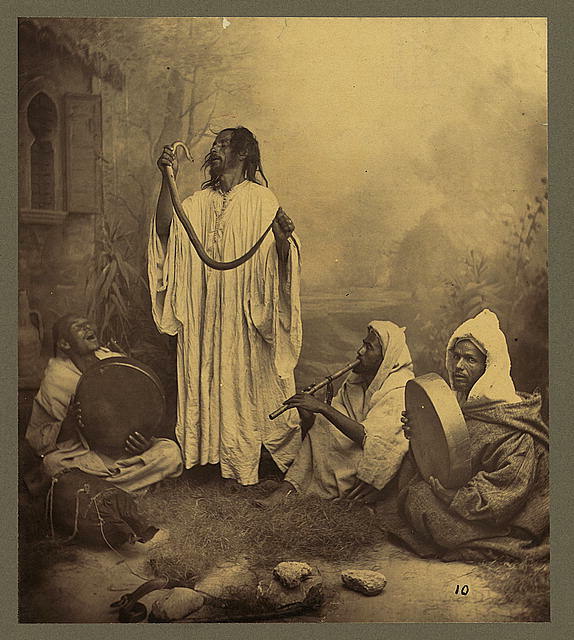 Snake Charmers, Morocco, Tangiers, late 1800s. Photo by Tancrède Dumas, public domain. *Note: mine is not an official Department of State website. Views and information presented herein are my own and do not represent the Fulbright Program, the U.S. Department of State or any of its partner organizations.